Product prices and availability are accurate as of 2019-04-03 11:10:05 EDT and are subject to change. Any price and availability information displayed on http://www.amazon.com/ at the time of purchase will apply to the purchase of this product. No matter if you have lived in the same state your entire life, or packed up and moved away, there will always be a special connection between you and the place you call home. Show your state pride in your bar or man cave with the addition of a personalized state pride slate coaster set. 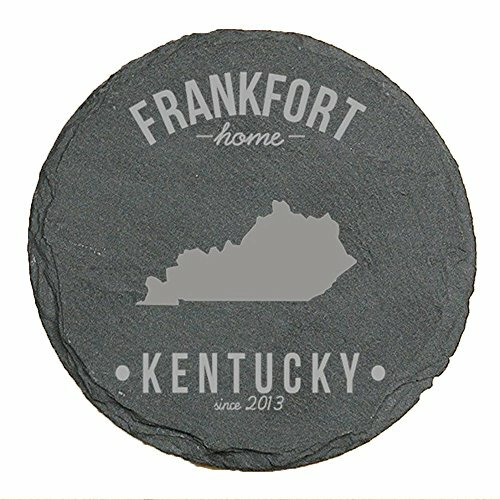 Made of a natural slate material, these custom coasters look great and help to protect any surface from drink condensation. Each round coaster measures 4" in diameter which is wide enough to fit under any standard size glass or bottle. This custom coaster set is the perfect gift for any Kentuckian! Each coaster will feature the shape of Kentucky, along with the state name, any year, and the name of any city or town. We will carefully laser engrave this customization into each item at no additional cost to you. With pads underneath the surface to protect your tabletops and counters, this coaster is a great and practical addition to any bar or kitchen. Next time you're enjoying your favorite beverage, rest it on a personalized slate coaster! This set of 4 coasters makes for the perfect gift for him or her!